A nice chalet located in a famous Urbanization in Los Barrios. A large plot (257 m²) distributed on a ground floor with a nice outdoor with 36 m ² garden area with different trees. Four bedrooms, 2 bathrooms, a living room with chimney and a fully equipped kitchen with white furniture and appliances. A private parking of 87 m². Three fitted wardrobes and marble floors. .
A terraced house for sale or to rent in Los Barrios. Three floors, basement, storage room, kitchen, four bedrooms, lounge, walk in wardrobe and a large bathroom with a bath and separate shower upstairs and a bathroom with a shower downstairs. Garden with fruit trees, auxiliary room and kitchen. Situated on the corner of the estate, it is one of the largest houses with two porches. At the end of the garden there are some stairs which lead to a large roof terrace which is above the garage which has space for two cars and has a toilet and sink. There is a communal pool, tennis courts, small park and grass areas and an area to play football. 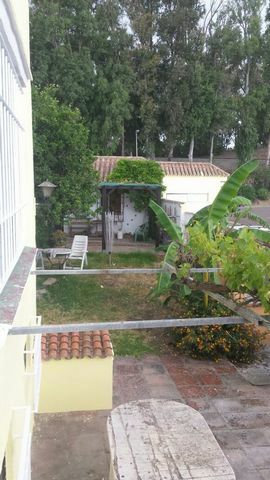 ---ESPAÑOL-- Una casa adosada en venta o para alquilar en Los Barrios.Tres plantas, sótano, trastero, cocina, cuatro dormitorios, salón, vestidor y un baño grande con bañera y ducha separada arriba y un baño con ducha abajo.Jardín con árboles frutales, sala auxiliar y cocina.Situada en en la esquina de la Urbanización, es una de las casas más grandes con dos porches. Al final del jardín hay algunas escaleras que conducen a una gran terraza que está por encima del garaje que tiene espacio para dos coches y aseo. Hay una piscina comunitaria, pistas de tenis, un pequeño parque y áreas de césped y un área para jugar al fútbol. This Semi Detached property comprises of 5 bedrooms, 3 bathrooms, 1 balcony, 1 terrace, 2 porches, garage for 2 cars and a private garden of 100m2. Rental price include the water and electricity. Villa for Sale in Los Barrios. Exelente Opurtunidad para amantes de tranquilidad y Naturaleza , Cortijo situado en el parque natural el Cornocales en la Urbanizacon* Cancho de benharas m del Duque * a tal solo 15 km de Sotogrande. Finca de cuatro dormitorios y dos baños. La planta baja consta de un amplio salón con techos altos y chimenea. Cocina totalmente equipada y comedor . Tres dormitorios y un baño, Planta primera El dormitorio principal con baño en-suite. Propio pozo de agua. Gran parcela con piscina privada, arboles frutales .Orientación Sur. Finca - Cortijo, Los Barrios, Costa del Sol. 4 Bedrooms, 2 Bathrooms, Built 350 m², Terrace 150 m², Garden/Plot 2900 m². Setting : Country. Orientation : South, South West. Condition : Excellent. Pool : Private. Climate Control : Air Conditioning, Fireplace. Views : Sea, Mountain, Country, Garden. Features : Fitted Wardrobes, Private Terrace, Satellite TV, Storage Room, Ensuite Bathroom, Jacuzzi, Barbeque, Double Glazing. Furniture : Fully Furnished. Kitchen : Fully Fitted. Garden : Private. Security : Alarm System, Safe. Parking : Garage. Utilities : Electricity, Drinkable Water, Telephone. Category : Investment. Finca Cortijo with 2900 m2 of land. 209m2 built plus little 140 m2 building for storage. Lovely private garden with fruit trees, Nice private swimming pool, 360 panoramic mountain views.South orientation. Chimney . Private Terrace, Double windows. Fully furnished ready to move in Garage for 3 cars. The house is situated just 20 min drive from the Luxury Sotogrande port. Just 25 minutes from white sandy surfing beach of Tarifa. 15 minutes from Gibraltar airport. it is a perfect property for people who like a quiet relaxation in the heart of Spanish nature.